When it comes to variety in fashion, we Indians have a wide variety, No doubts! So When Unlimited stores, a Budget friendly clothing store with stores spread across the country, asked if I would take up their #3kunlimited challenge, I instantly said yes and decide right away that I will be styling Indian clothes this time. I thought that for 3 thousand rupees I will get at most 2-3 pieces of clothing, but I ended up with 5! That’s how budget friendly their collection is! 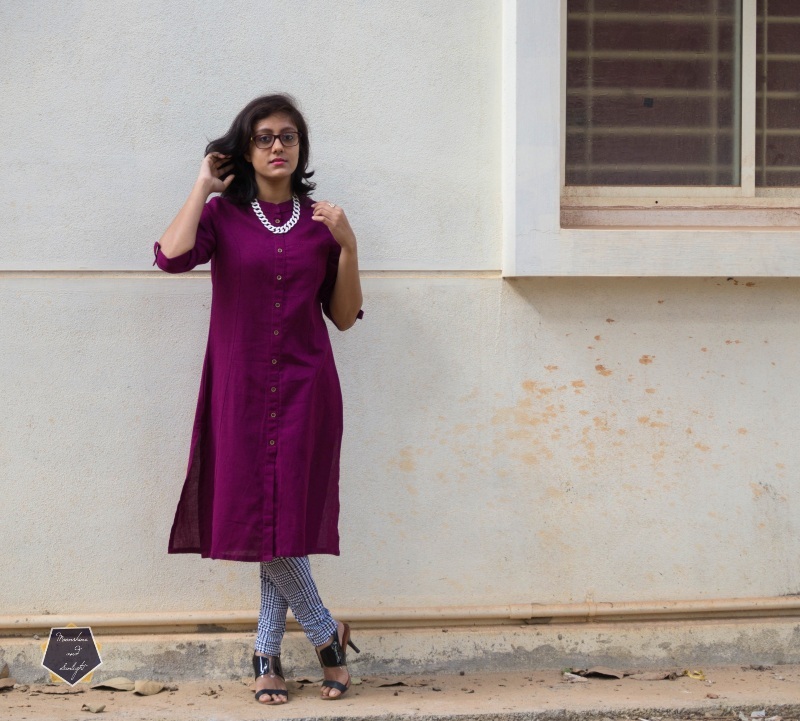 They have a very good collection for both Indian wear and western wear and I was tempted to style a western wear piece so I picked up one and Styled it! comfortable! Especially for office goers with a strict dress code. When I shop I look for pieces that can be styled in numerous ways and is not something that I can wear till its” trending”. I styled this off white jute cotton kurta which has golden zari detailing with a cotton printed palazzo pant. We all have done the “legging and kurta” thing I guess and I wanted have a more voluminous, easy breezy look which is super comfy at the same time. The kurta and the palazzo can be worn in many ways, separately and these are budget friendly as well. I styled it with a printed leggings , because the kurta is quite voluminous itself , I wanted to wear it with something different and these printed , jeggings sort of leggings were the perfect thing to give it the break the monotone of the solid colored kurta. Plus, this can be worn with any top or shirt! I kept the accessories pretty forward with a gold band ring and a white and gold neckpiece. After styling these I can say that they have a really good collection and the options are very budget friendly! Perfect for your casual wear or everyday wear and you can be stylish with in a limited budget! I had a small issue with the sizes they keep. I picked up a size bigger than what I usually wear and these are a little loose for me. But the size smaller than this is extremely tight for me, no in between! But since both of the Kurtas are made of shrinkable materials, I didn’t take a chance with the smaller size. Let me know which look do you like more ? ?